Thanks to Drs. Safa Alshaikh, Zainab Harb and Huda Jamsheer, Salmaniya Medical Complex, Kingdom of Bahrain for contributing this case and to Dr. Hillary Kimbrell, Myriad Genetics, Inc., Utah (USA) for writing the discussion. To contribute a Case of the Week, follow the guidelines on our main Case of the Week page. (1) Thanks for visiting us at USCAP! We had a wonderful time in San Antonio, Texas. It was great talking to everyone who stopped by the booth. We appreciate all the feedback and suggestions. We posted the pictures that we took on our Facebook page. 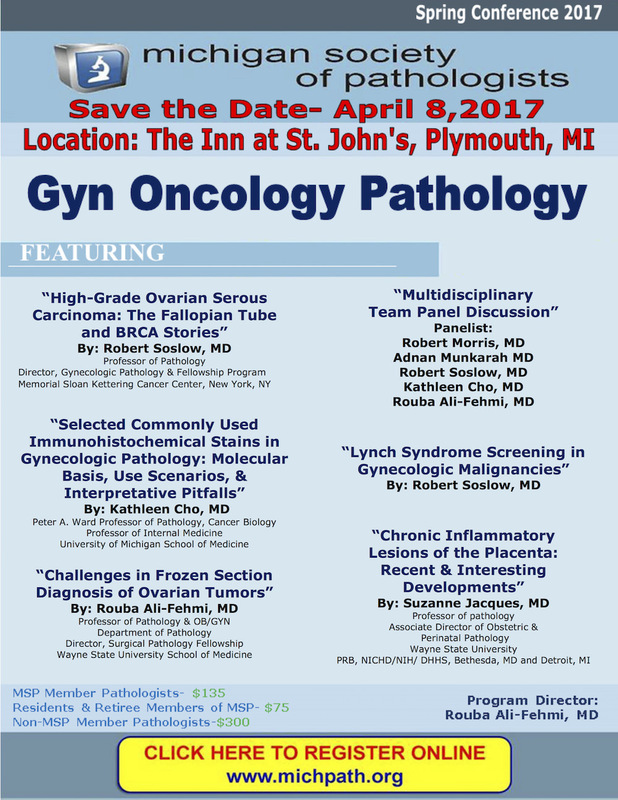 The next major conference we will be exhibiting at is the ASCP '17 conference in Chicago. (2) Please add NatPernick@gmail.com to your SafeList / Address book, so our email subscriptions go directly into your inbox. (3) Are you an Amazon Prime member? If so, you can still use our Amazon link to make your purchases and still have all the benefits of your Prime membership! We receive a commission (~ 5%) from all purchases made through this link, whether pathology related or not, at not cost to you. You get the benefit of wide selection of products and sellers, product reviews, a low price, and the knowledge that you are helping us maintain and expand our free website for the pathology community. A 71 year old man presented with multiple firm left submandibular swellings for two months, the largest 3 x 2 cm. Physical exam also revealed an ulcerated lesion on the gum, which was biopsied. A. Both use the same staging criteria. B. Sun exposure is a risk factor for both. C. They have a similar prognosis. D. They have the same immunohistochemical profile. E. Both commonly have BRAF mutations. Primary mucosal melanoma (PMM) arising in the head and neck is rare, accounting for <1% of all melanoma cases. It occurs equality in men and women, with a median age in the 60's, although it can occur at any age. In the head and neck, the most common sites are the nose, paranasal sinuses and oral cavity. In the oral cavity, the most common sites are the upper maxillary alveolar ridge and the hard palate. Clinically, lesions are flat or nodular, with variable pigmentation. Presenting symptoms include pain, bleeding, ulcers and poorly fitting dentures, although usually they are asymptomatic. PMMs tend to be more aggressive than cutaneous melanomas - up to 60% of oral melanomas present with lymph node metastases (as in this case). The most common sites of distant metastases are lungs, liver, bone and brain (Head Neck 2016;38:147, Oral Surg Oral Med Oral Pathol Oral Radiol 2016;122:17). Staging criteria differ from that in cutaneous melanoma. Oral melanomas are thought to arise from melanocytes normally present in the mucosa. Risk factors are uncertain but may include inhaled or ingested carcinogens (e.g., smoking, formaldehyde fumes), family history and pre-existing mucosal nevi. They are not associated with sun exposure (Head Neck 2016;38:147). Histologically and cytologically, oral melanomas are as varied in appearance as cutaneous melanomas, ranging from spindled to epithelioid (Oral Surg Oral Med Oral Pathol Oral Radiol 2016;122:17). 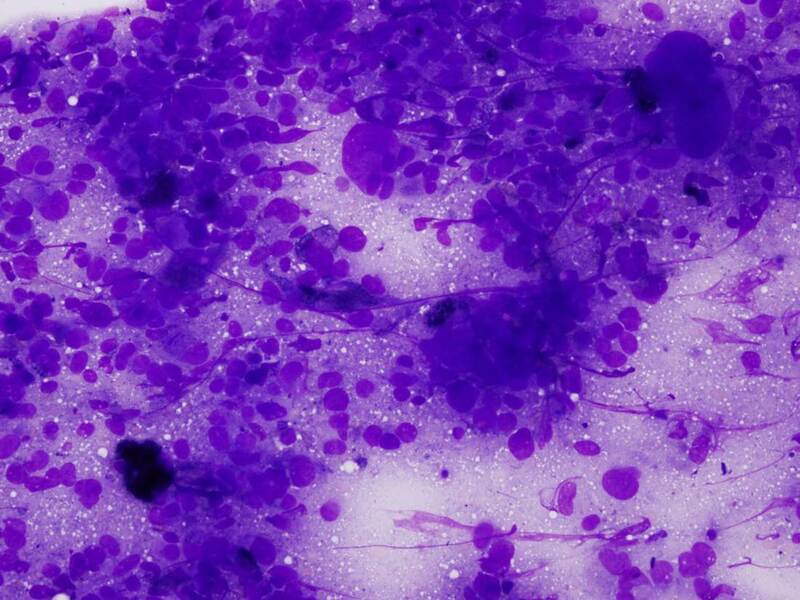 On fine needle aspirate, melanoma cells are dyscohesive, and nuclei tend to be peripherally located with a single prominent nucleous. 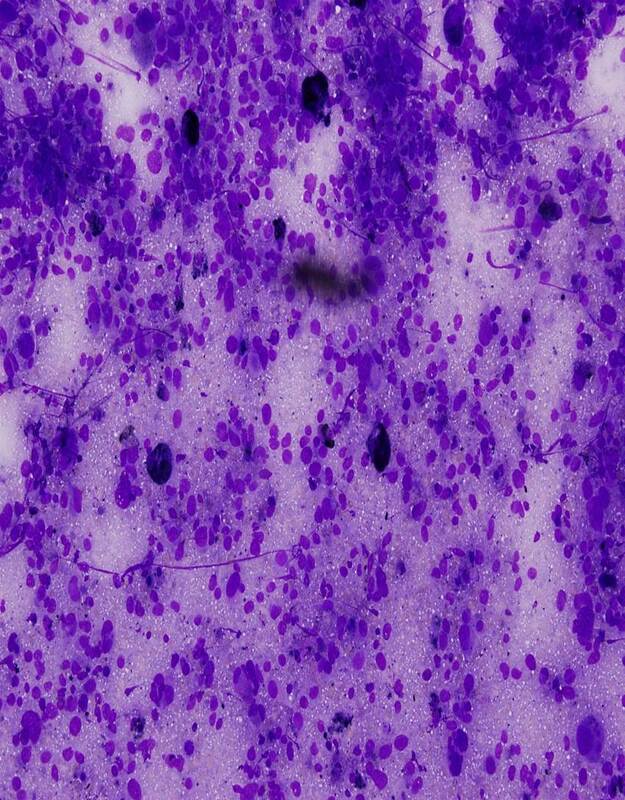 Binucleation (DeMay's "bug-eyed demons") is common, and nuclear pseudoinclusions can be seen. 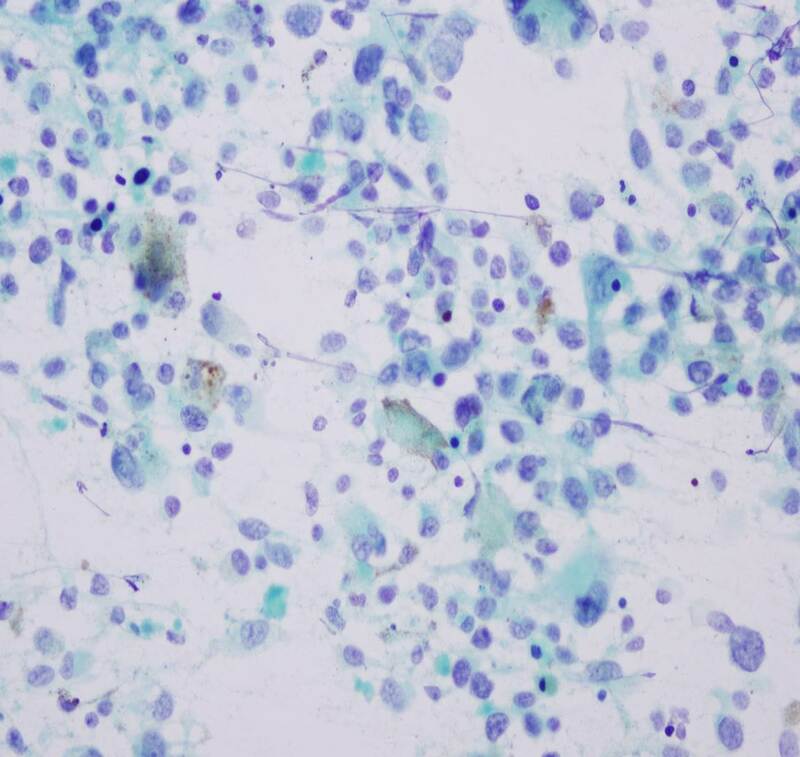 Melanin pigment is dark brown on Pap stain and blue-black on Diff-Quick; however, it is not always present, especially on aspirates of metastatic lesions. Small cytoplasmic vacuoles can occasionally be seen on air dried smears. 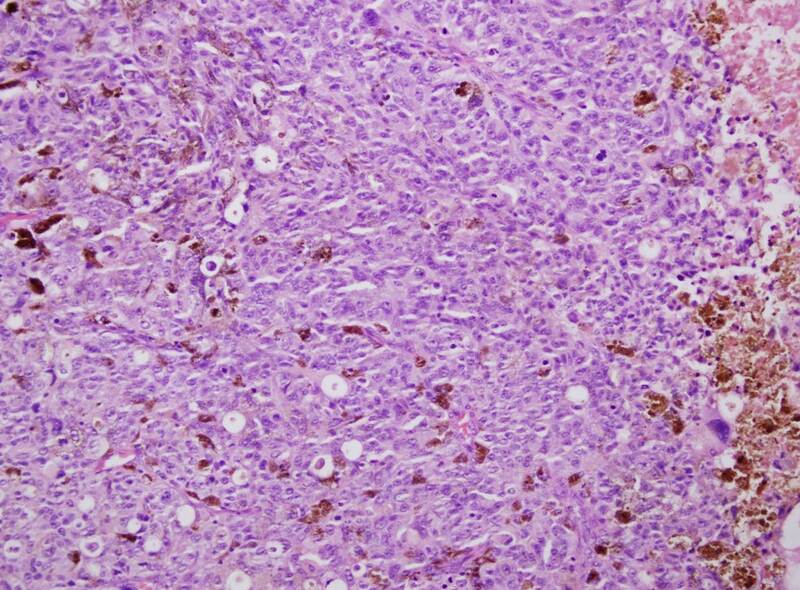 As "the great mimicker", melanoma can have a small cell pattern that resembles small cell carcinoma, as in this case. 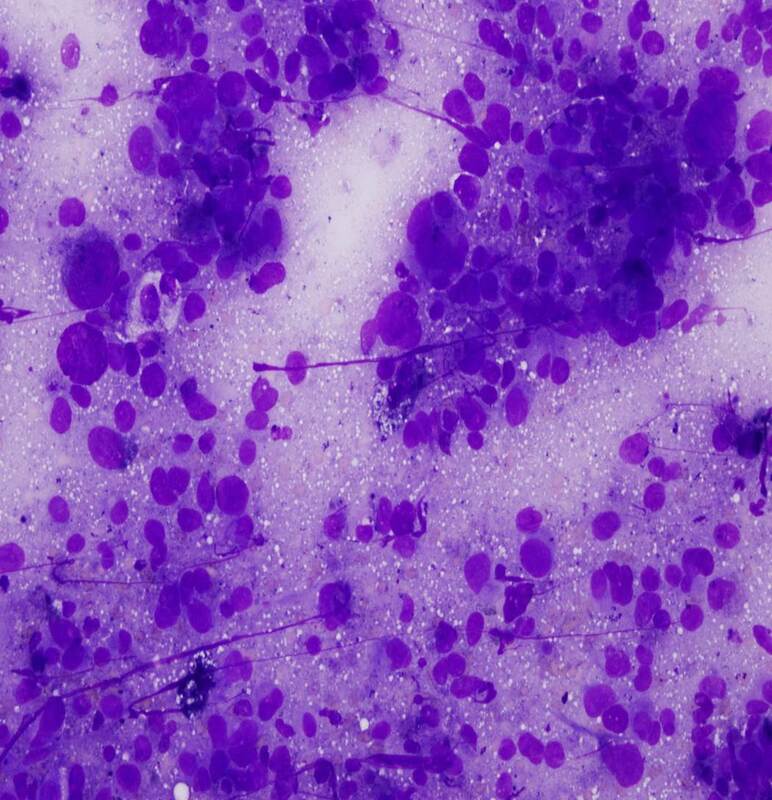 However, this case contains scattered cells with extremely large nuclei, as well as melanin pigment, which supports the diagnosis (DeMay: The Art & Science of Cytopathology, 2nd ed, 2011, Cibas and Ducatman: Cytology: Diagnostic Principles and Clinical Correlates, 4th ed, 2014). 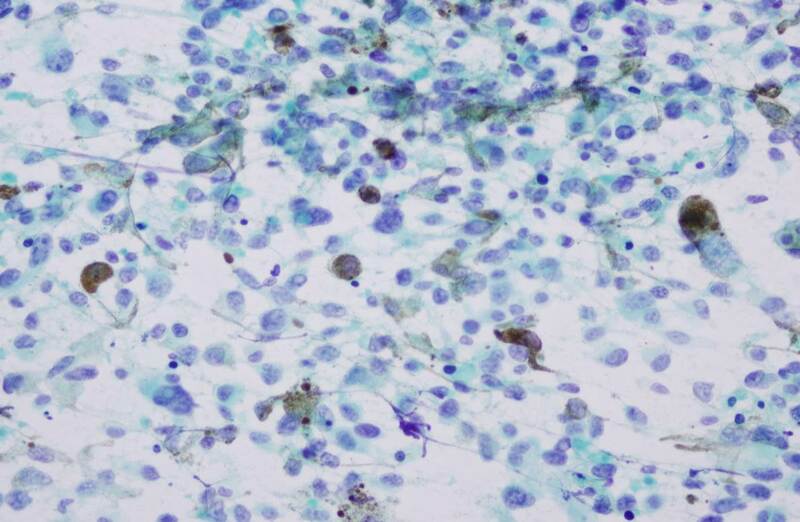 Immunohistochemistry for PMM is similar to cutaneous melanoma, with variable expression of S100, MelanA, HMB45, MITF and tyrosinase. 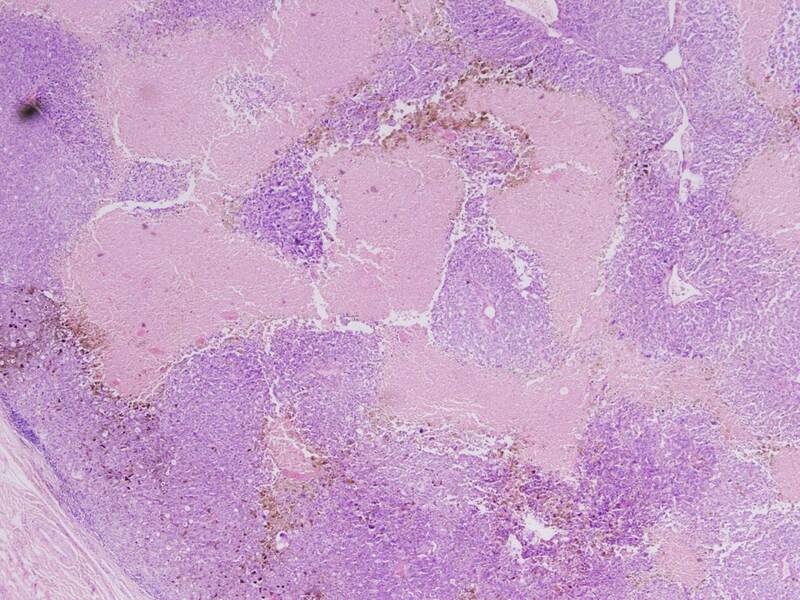 Loss of p16 staining is seen in 74% of cases (Head Neck 2016;38:147). 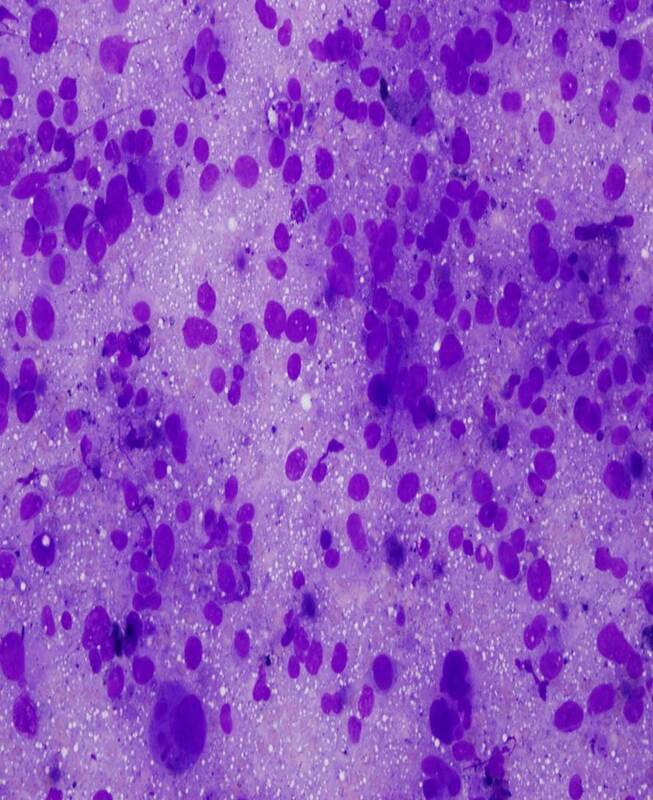 Compared to cutaneous melanoma, PMM has an increased frequency of mutations in c-KIT (up to 40% of cases), and a decreased frequency of mutations in BRAF (<10% of cases) (Head Neck 2016;38:147). The prognosis of oral melanoma is exceptionally poor, with a mean survival of 4 months, and a five year survival of <30%. The most effective treatment is resection with negative wide margins. Adjuvant radiotherapy can help control local disease, but does not seem to improve overall survival. Ongoing studies are testing combination chemotherapy and immunotherapy, as well as targeted agents such as imatinib (a c-KIT inhibitor), ipilimumab (an anti-CTLA-4 antibody), and anti-PD-1 antibodies (Head Neck 2016;38:147, Oral Surg Oral Med Oral Pathol Oral Radiol 2016;122:17). D. They have the same immunohistochemical profiles. 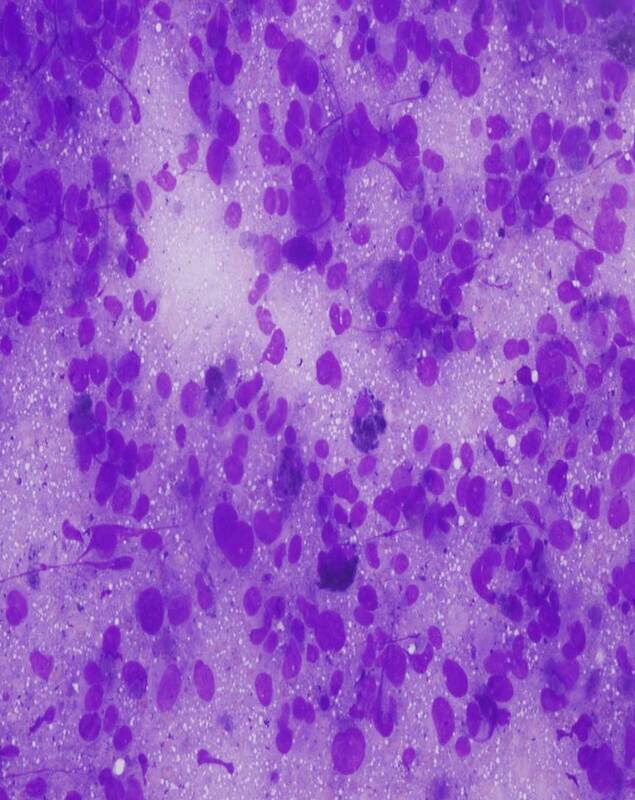 Primary mucosal melanomas share histologic and immunohistochemical features with cutaneous melanomas, but differ in terms of risk factors, aggressiveness, molecular profiles and staging criteria.